He has lamented that my modus operandi the past decade has been to engage daily in one-to-one conversations with a select few according to my curiosity and associated research. He kindly believes that the work I do is valuable to many so it’s wasteful and unethical not to make an effort to publicly share at least snippets. I spend the vast majority of my time working without monetary reward pondering the future of mobile/wearables and how they could be leveraged in a meaningful way, to make our lives better. It is my core belief that humanity lives, relative to where we could easily be, in the “dark ages”. The problem is that since we have been brought up in such darkness, we find it very difficult to imagine light and spend our time at best, debating what is tantamount to, varying shades of black. It’s funny that you are making a product with this vision and I am trying to make a community/event with a matching vision; i.e. the vision does not belong to one company, i.e. it’s an epic opportunity and represents a significant cultural/global level shift on the verge of starting. Because I’m working on an event and not a product, I have to draw wider lines. My vision is that computing will be worn. 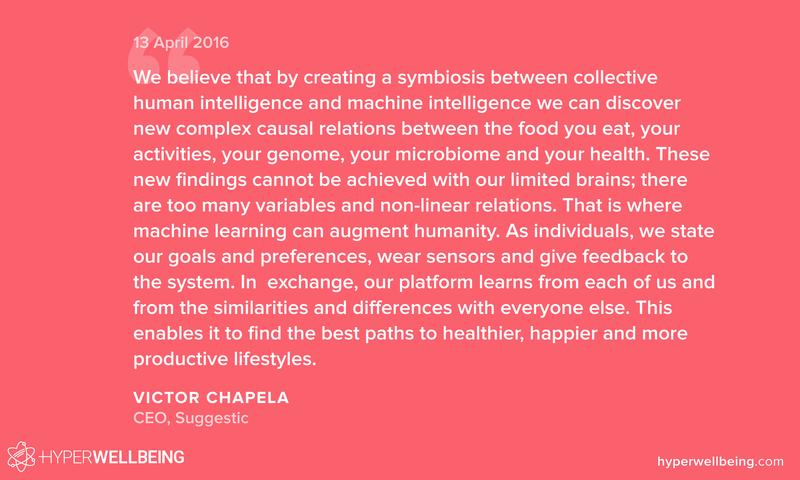 That computing will (or can) be leveraged to massively improve our health (mainly preventive/predictive), our happiness (owing to intersection of contemplative science and neuroscience being coded up in software) and our life actualization (potential/flourishing). We will begin solving the health part first, then the happiness part and then last, the hardest, the flourishing part. The health part will be done within the next 10 years, primarily. The flourishing part could take three decades. Wearable computing is the major key to create the symbiosis – it’s the physical layer contact point. In terms of limited minds, yes evolution has left us unfit for the environment we now find ourselves and obviously our biology can’t adapt quick enough. This move into the “third computing revolution” that I speak of is like our species creating for itself a fourth brain to overcome the slowness of genetic evolution. That fourth brain will be partly worn on us, and also partly processed centrally in the cloud (for heavy processing parts). The emerging industry [hyper wellbeing] ecosystem is one of “Life Navigation” – how to route from A-B, that is between birth and death optimally – you clearly see something similar when you state “best paths”. Also you state “learns from each of us and from the similarities and differences with everyone else.” – yes and this will also be applied to our relationships and other matters of happiness – your fourth brain will know better than you which partner is better for you, when to quit a relationship better than you etc. “These new findings cannot be achieved with our limited brains” – yes and imagine when we can also feed in data about our emotions automatically (affective computing) and our relationships intimacy details etc.